Want to be notified of new releases in smile-io/ember-cli-stripe? Simplest way to implement card payments in your Ember app. 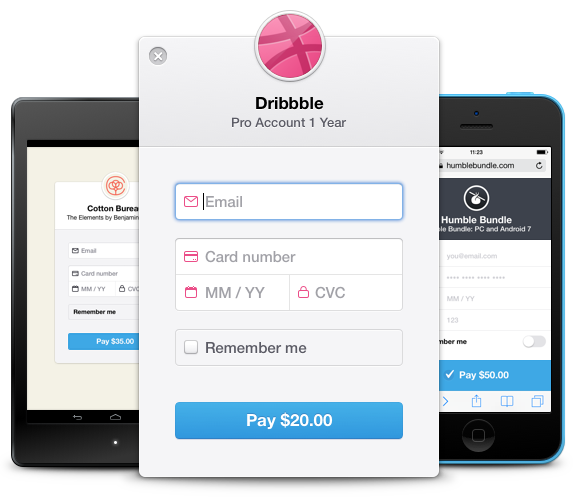 This addon integrates Stripe's embedded payment form, Checkout. See Stripe Checkout docs. The best documentation is the sample application in tests/dummy. label Stripe Checkout button text. isDisabled When true, the Stripe Checkout button is disabled. showCheckout Can be used to open the Stripe Checkout modal dynamically. Besides the above, all Stripe Checkout configuration options are supported. If you notice anything missing please open an issue. The primary action of this component, onToken is called when the Stripe checkout succeeds. Its main param is a Stripe Token object. onToken The callback invoked when the Checkout process is complete. onOpened The callback invoked when Checkout is opened. onClosed The callback invoked when Checkout is closed. All Stripe Checkout configuration options can be set in your apps config. In most cases, you will want to add at least your Stripe publishable key to your app's config, but this can be set as a property on the component too. Note: If Stripe options are set in the environment.js file and when invoking the component, the later value will win. Multiple Stripe keys are supported, when passed directly to the component. This addon is tested against Ember 1.13+. For older versions of Ember, use version 0.4.0 and check the old docs. Note: At your own risk, feel free to try current version, it might still work.